The majority of testers consider the Adidas Crazy Explosive as one of the top performance basketball sneakers of 2016. Almost all users just love the plush and responsive feel of the Boost cushioning in these Adidas basketball shoes. Full-length Boost is also implemented in James Harden’s third sneaker. Overall comfort is amazing, according to many. A lot of the wearers noted that the shoes fit perfectly. Many reviewers observe that the Crazy Explosive has great traction and requires minimal wiping. The shoes have great ankle support, many reported. A good number of buyers noted that these Adidas shoes provide good support and can be used in other sporting activities. Some mentioned that the shoe is lightweight and breathable. A great number of buyers give the Crazy Explosive a high overall satisfaction rating. Most wearers complain about the shoe’s fit. Some say the shoes run small, while others say they run a bit big. A few say that the shoes feel loose around the ankle area. A small number notice that it’s hard to get a good lockdown due to the unconventional lacing system. A good number report that some eyelets broke just after a few months. Some users observe that the traction started to peel off just after a few weeks. Like Nike’s Hypedunk X, a handful report that the Adidas Crazy Explosive is hard to put on. The Adidas Crazy Explosive is regarded as one of the best performance basketball shoes of 2016. It is versatile, and it is for any type of player. It provides a plush ride, responsive Boost cushioning, good step-in comfort, great impact protection, great traction, and solid foot containment. The adidas Crazy Explosive is definitely a great shoe and exceeded expectations. They are the most comfortable pair of basketball shoes I've ever owned. Whether it is the PrimeKnit version or the Neoprene version, this shoe performs great and would definitely be a go-to for many hoopers out there. The Crazy Explosive is the beginning of a new franchise of basketball sneakers for Adidas. It was designed around the playing style of Minnesota Timberwolves’ rising star Andrew Wiggins. For the first time, Adidas implemented full-length Boost cushioning in a mid-cut shoe. It’s a new approach, the use of Boost in basketball. 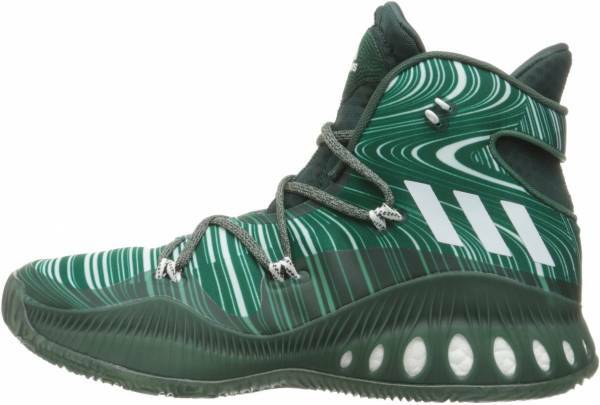 The Crazy Explosive also has a digitally mapped “Power Traction” for a controlling grip for jabs or, in Andrew Wiggins’ case, signature baseline spin moves and plant-to-a-tomahawk dunk. Cushion. The Adidas Crazy Explosive features the first-ever full-length Boost midsole in a basketball sneaker. This cushioning setup provides enhanced comfort, energy return, and impact protection. The midsole is wrapped by a TPU roll cage along the lateral side for stability and is supported by a full-length infinity-shaped torsion plate. This setup helps fine-tune the Boost cushioning. Traction. The Adidas Crazy Explosive has a rubber outsole with a digitally designed Power Traction pattern that’s the first of its kind. This multi-directional pattern provides enhanced grip and stability on hardwood. Length and Width. The Adidas Crazy Explosive gets mixed views regarding its fit. Buyers are advised to try the shoes out at a local store before purchase. Lockdown. The Adidas Crazy Explosive features an extended GeoFit bootie. This anatomical foam construction conforms to the foot over time. The effect is a glove-like fit that allows for a tight but comfortable lockdown. The anatomical lace system wraps the entire foot. This lacing system relieves pressure and provides an enhanced locked-down fit. The Adidas Crazy Explosive features a full neoprene upper for lightweight support. A flexible TPU layer covers high-wear areas around the shoe for added support, durability, and containment. The Crazy Explosive also includes a GeoFit bootie that provides enhanced breathability and support around the foot. The GeoFit foam extends with the mid-top design of the Adidas Crazy Explosive. The foam wraps around the midfoot, heel, and ankle collar. This helps provide comfort and support without restricting movement. The unconventional silhouette of the Crazy Explosive purposely draws a reaction. The shoe comes in a variety of colorways and also has a model that features a Primeknit upper. Prior to John Wall’s parting with Adidas, the Crazy Explosive was originally slated to be the third installment of his signature line. Ultimately, Wall did not sign his contract extension with the brand, and the Crazy explosive is now headlined by Minnesota Timberwolves’ up-and-coming star Andrew Wiggins. Even before the Crazy Explosive was officially unveiled, leaked photos surfaced online, and the radical sneaker received a lot of criticism. “When it leaked, and when people started putting it on Twitter and going after it, it’s not the way you expect to launch something brand new.” Jesse Rademacher, Adidas Basketball’s design director, said in an interview. “At the same time, it completely changed the conversation. It made people notice that we were doing something different whether they liked it or not.” he also said. This is the first shoe where Adidas Basketball took a whole new approach and challenged every aspect of the design. The goal of the project was to create something completely different, with design working around the playing style of Andrew Wiggins. The sneaker may have been ridiculed online but the comments of Adidas signee and Boston Celtics draft pick Jaylen Brown validated Rademacher’s vision. “Jaylen Brown’s first reaction was ‘Man, that thing looks like it’s from the future,” Rademacher said. “That was kind of the emotion that we wanted to get to and really resonate.” the designer said. The non-Primeknit version of the Adidas Crazy Explosive is available in several team hues.